The Aam Aadmi Party Friday claimed that Catch's revelation that the BJP had gone on a land-buying spree in Bihar in the days before demonetisation was announced was "clinching evidence" that the BJP leadership knew of demonetisation beforehand and had "already taken care of their black money". 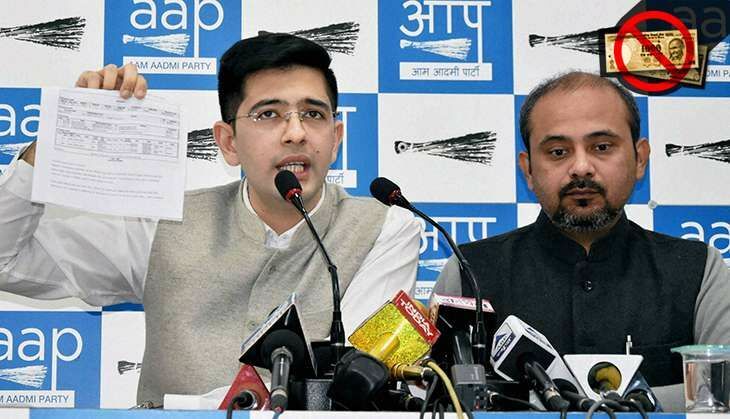 Addressing the media at AAP's office in Delhi, the party's spokesperson Raghav Chadha demanded that the BJP reveal to the public the names of its leaders as well as its "crony capitalist" friends who had converted their black money into white before the voiding of Rs 500 and Rs 1,000 notes, a sudden move that has plunged the entire country into misery. Chadha pointed to other pieces of "evidence" to back up his claim such as reports that the BJP unit in Bengal, a state where the saffron party has little standing, had deposited Rs 1 crore into the party's bank accounts just hours before Prime Minister Narendra Modi announced the scrapping of high denomination banknotes on 8 November evening. In all, the BJP unit in Bengal reportedly deposited Rs 3 crore in the party's accounts between 1 November and 8 November. The AAP spokesman then showed the picture of the Rs 2,000 notes put up, and later deleted, by the BJP's Punjab unit leader Sanjeev Kamboj on social media on 6 November, two days before demonetisation was announced. Also, he said, there are reports of "unusual, abnormal increase" in the deposits made with public-sector banks in the July-September quarter. Chadha said all these reports, taken with the Catch's revelation, made it clear that BJP leaders had been alerted about demonetisation while the country had been kept in the dark. Chadha displayed the printouts of land deed copies accessed and included in its report by Catch. According to the land deeds, some of the parcels in Bihar were bought on behalf of BJP president Amit Shah. "Sanjeev Chaurasia of the BJP, a member of the Bihar legislative assembly, has himself admitted that the party functionaries had been asked to purchase land on the instructions from the central party office. Land was even bought in Amit Shah's name. The money for the land came from the party itself and was paid in both cash and cheques, a large part in cash and a negligible amount through cheques," Chadha said. "This is clinching evidence that the party's leaders and their crony capitalist friends parked their illegal money in real estate or converted it into white money in other ways. And all this while the nation has been suffering. There are never-ending queues across the country, people are unable to withdraw their own money from the banks. There are reports of people dying." Chadha claimed AAP was also in possession of some documents showing that a cabinet minister of the BJP had bought 300 acres of land in Haryana just before demonetisation. "We shall release this documents soon, unless the BJP itself owns up to the scams," he said. Speaking to Catch after the press meet, Chadha demanded that the BJP rollback demonetisation that has people running helter-skelter, and also release the names of its leaders and "industrialist friends" who had made transactions to take care of their black money.